Risk on sentiment returned and traders were once again in the mood for buying overnight. As the Lira moved higher, Wall Street rebounded snapping a four-day losing streak on the Dow. Whilst the markets have regained their cool towards Turkey for the time being, it is highly unlikely that the whole crises can now be swept under the carpet. These confidence issues are rarely a one or two-day event, never to raise their head again. 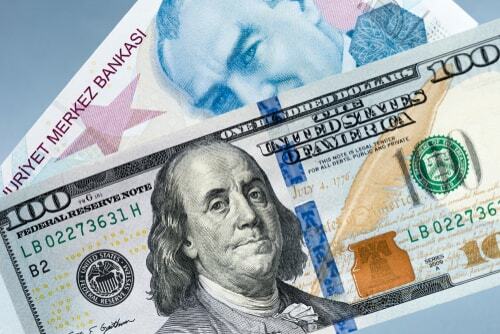 Not only is it unlikely that hostilities between Turkey and the US will simmer down quickly, but fundamentals are stacked against emerging markets right now as they struggle in a rising US interest rates climate. What was particularly noticeable across the previous session, was not the rebound in the Lira and other emerging market currencies, nor the return of the risk on trade – but more the resilience of the dollar which charged northwards to fresh one-year highs versus the pound, the euro, the Australian and New Zealand dollar. With US stocks rising overnight, the dollar’s increase can’t be linked to risk aversion, import and export data from the US was also lacklustre, so not likely to have lifted the buck. The rally in the dollar comes back to the strength of the US economy and the fact that the US Federal Reserve is travelling along the hiking path unaccompanied by other central banks. Somethings needs to go seriously wrong for the Fed not to hike next month. US Retail sales to beat 0.1%? Investors will now look towards US retail sales due for release later today. With wages on the up and the labour market growing, there is good reason to expect a solid retail sales number, potentially better than the 0.1% forecast. UK Inflation Data to Support BoE hike decision? With the dollar going from the strength to strength the pound is falling by the wayside, hitting a fresh yearly low of $1.2705 as Brexit concerns and sluggish wage growth dent demand for sterling. Attention will now move to inflation data which will be scrutinized closely following the miss on wage data today. The CPI is expected to print at 2.5% year on year in July, up slightly from June’s 2.4%. Core CPI is expected to remain constant at 1.9%, which indicates that the rise in CPI is most probably down to oil prices which have risen around 12% year on year, something that the BoE tends to look through when considering whether or not to hike interest rates. The information and comments provided herein under no circumstances are to be considered an offer or solicitation to invest and nothing herein should be construed as investment advice. The information provided is believed to be accurate at the date the information is produced. CFDs are complex instruments and come with a high risk of losing money rapidly due to leverage. Please note that 79 % of our retail investor accounts lose money when trading CFDs. You should consider whether you understand how CFDs work and whether you can afford to take the high risk of losing money.